Explanation: Did you see the Full Moon last night? Near the horizon, the lunar orb may have seemed to loom large, swollen in appearance by the famous Moon illusion. But the Full Moon really was a large Full Moon last night, reaching its exact full phase within an hour of lunar perigee, the point in the Moon's elliptical orbit closest to planet Earth. A similar near perigee Full Moon last occurred on December 12, 2008. The difference in the Moon's apparent size as it moves from perigee to apogee, its farthest point from Earth, is about 14 percent. Of course, a nearly Full Moon will rise again tonight, lighting the skies on the date of the Equinox or equal night. The Full Moon also looms large in this well-planned, telescopic lunar portrait. 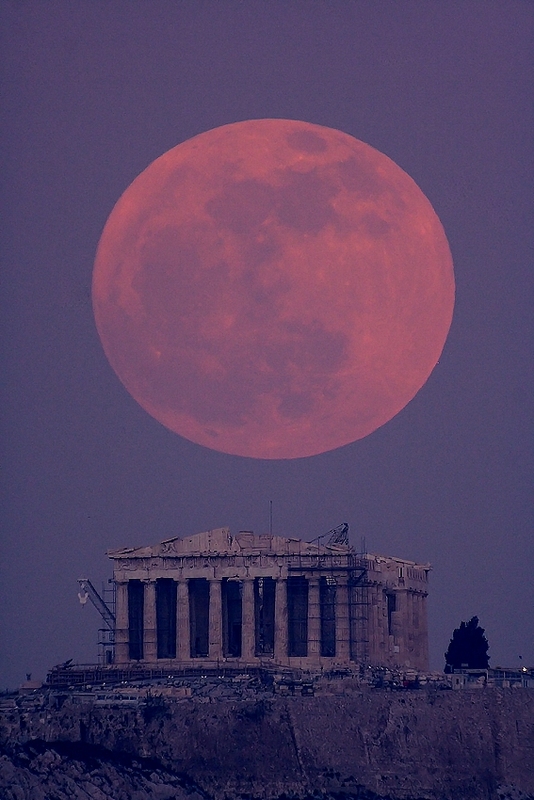 Captured earlier this year, the rising lunar orb is dramatically matched to the 2,500 year old Parthenon in Athens, Greece.